Crown your dad the world's number 1 with this quirky Father's Day mug. The mug features a cartoon dad with two kids and is personalised with a name. The image and text appear on both sides of the mug. The 10oz ceramic mug is scratch resistant and safe in both a microwave and a dishwasher. Wishful thinking for your dad. Every time he drinks tea or coffee from this mug he can imagine he's enjoying a beer. 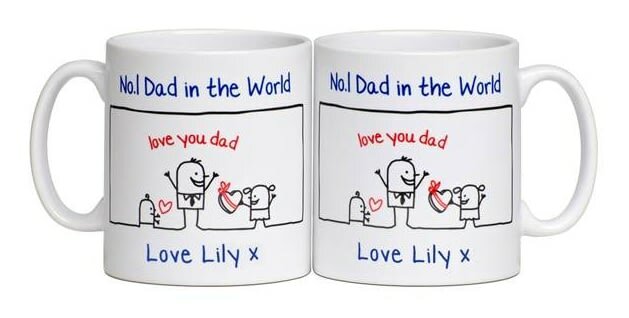 Tell your old man that he's a super dad and give him this mug, personalised with his name above the Super Dad logo. Show your Step-Dad how much he means to you with this super hero themed mug. Is your Dad Awesome? The Best or just Pretty Cool? Why not tell him with this personalised mug? Make this mug even more special by including your very own personalisation.